Witnessing Ariel Kotker’s exhibition last fall at the Flywheel was like walking into an exploded graphic novel. The forms are simultaneously familiar and fantastic. My mouth sort of fell open and gasped. Oh my, what feats of craft! The collection of objects making up the incredible installation, His Room As He Left It, is an ever growing alternate world of handmade items composing the room of Drey Fank. Years in the making, this body of work is a process based, detail rich study. 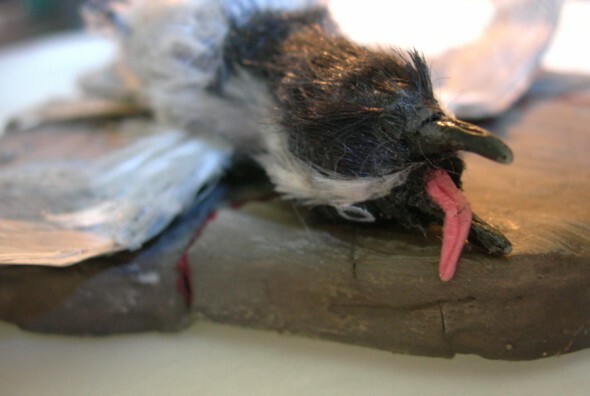 The story of Drey Fank is told through these objects, all detailed by the artist Ariel Kotker on her blog http://hisroomasheleftit.blogspot.com/. Encountering this work gives me the same pleasure as obsessing over tiny treasures at the flea market or sifting through the family history of an abandoned house. Much can be learned from habitats. Here in this room we are faced with the labor of the artist and an incredible vision of imagined life mixed with our own object bound assumptions about other beings. This work demands careful looking and encourages imagination. Had I known gentle touching was allowed I most definitely would have touched the corduroys which are one of my most favorite objects in the room. Thanks Ariel Kotker for sharing your work with us. 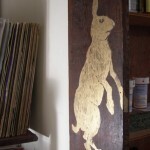 Be sure to check out Ariel Kotker’s other projects at http://fecit-ak.blogspot.com/. Everything she creates has incredible charm and wit. Especially the comics! I like things, and much of what I do is just about making things, however there is a story line in His Room As He Left It, which is my main project. 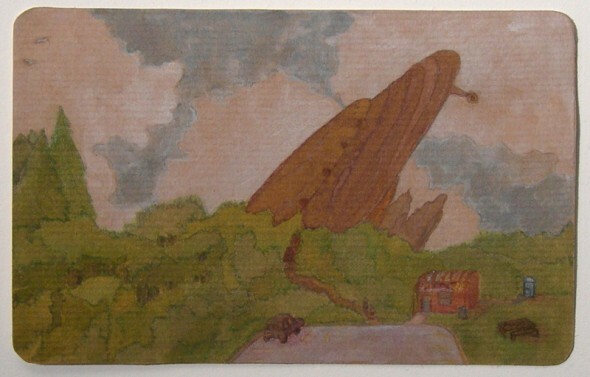 It’s a coming of age story involving a flying saucer, taxidermy and reincarnation. It’s a work in progress. I was at SMFA in Boston, in my little studio behind the wood shop, where I would write little snippets of nonsense and use them as labeling for fake products in found glass jars. I’d make a drawing using the nonsense phrases, mask it off with frisket, then go down to the sandblaster to blast out the words. Then I’d fill the jars with silly things like pills of paper pulp, spindles of steel wool, or hand-sewn, cotton-filled plaid pads. 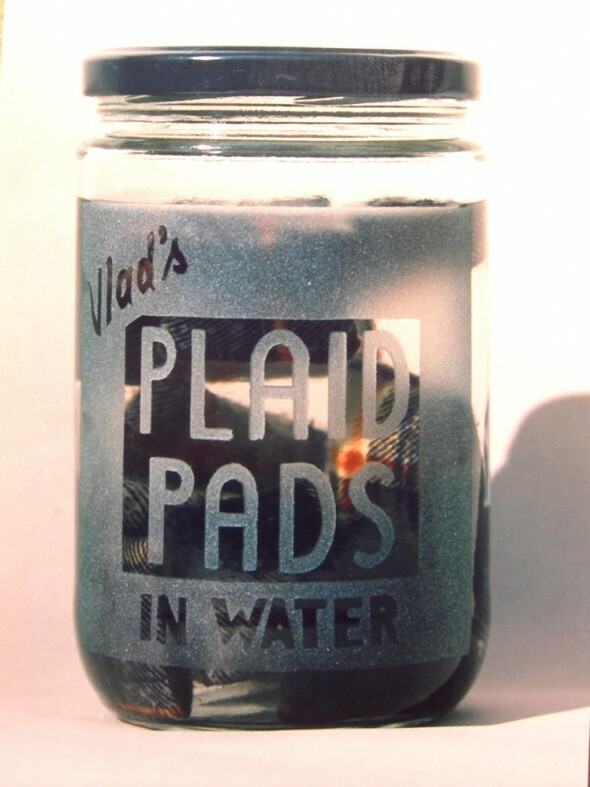 “Vlad’s Plaid Pads in water” is a favorite of mine. How do you see your art in relation to cultivating community, and how does community affect the work you make? I often isolate myself, so I must create my own community out of the things I make. Then, if someone is interested, these things get shared, via a showing or just conversation. I feel more alive after the sharing, and I use feedback folks have given me to form new ideas. When I’m not isolating myself, I view other people’s work in galleries and studios, and come away with little sparks of thought and images which act as a kind of kick-in-the-pants for my brain. I’m especially attracted to bluejays and other Corvids. and rabbits. I get curious about houses. Sometimes I visit craigslist just to view apartments with pictures attached. I am thrilled by local history, so I like to research how spaces appeared in the past, such as the old felt factory, state hospital, or the canal which ran down State Street. I used to make drawings of buildings and fields near the old State Hospital. That was fun. Maybe I should try that again. thanks for reminding me! What are some strategies you use to sustain your art practice (while living in the Northampton area)? I keep company with other artists, writers and musicians, which luckily are a-plenty in the area. Most of my friends are creative types so we share enthusiasm for making stuff. I’ve used the Valley Art Share site to connect with people, and I also keep a makeshift studio at my apartment. My Mom has donated my childhood room for me to use as a studio, but when I can’t seem to get over there, I paint my furniture with animals, just to keep going. I try to carry my wits about me but I often drop them.